Woodland Caribou Provincial Park, Ontario. We spent the day yesterday just driving from Thunder Bay - the plan was to meet up with our friend Guy in Red Lake who'd gone on ahead the day before. Red Lake is still in Ontario but north west of Thunder Bay (north of Vermilion Bay). We arrived late last night and bunked at Guy's apartment .... right on the waterfront in the town of Red Lake. 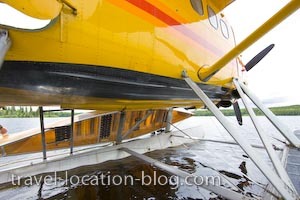 We woke this morning to the throaty sound of various float planes taking off from right outside the back door! Unfortunately the weather wasn't playing with us once again, so the scene outside was one of drizzly grey. Red Lake is the "Norseman" capital of the world!! What is a Norseman? you may ask ... well a Norseman is a single engine bush plane which was the brain child of one Robert Noorduyn who originated from the Netherlands. Although Mr Noorduyn was designed in the Netherlands, the Norseman however was designed in Montreal, Canada in 1934 at Noorduyn Aircraft Limited and first flown in November 1935. The aircraft which could be fitted with floats, skis, or wheels, proved itself to be a reliable and rugged workhorse providing access to Canada's remote wilderness regions. Here's another fun fact: the fuselage of the Norseman is in fact covered with a fabric skin (attached to the steel and wood frame). Despite the precipitation, Guy hooked us up with a few of the fellas down on the float plane dock who fly with Chimo Air Services. Chimo Air provides transport for visitors to the region and to Chimo Lodge and Outposts - a fly-in camp situated in the remote wilderness of Northern Ontario and a world class destination for Walleye and Northern Pike fishing. There was a pick up scheduled in the Woodland Caribou Provincial Park - a group of 3 men who'd been canoeing the network of lakes in the park and camping for the past week required a flight back to Red Lake and the only way in or out of the park is by air or water. We climbed aboard the Otter and donned our much needed earmuffs to take to the grey skies. Even though the weather didn't co-operate, the flight was great. On the way there we were the only passengers so had the pick of seats. We flew over vast expanses of forests, lakes, and islands which were spread out below us like a patchwork quilt - all connected somehow by a network of small streams and rivers. Eventually we spotted our three paddlers from the air and lined up for a steep descent onto the lake where they would paddle out to meet us. Once they'd paddled over, the pilot and his assistant helped the three fellas aboard and proceeded to hoist the canoe onto the plane floats and tie it on. Donning our earmuffs once again, we taxied a short distance before taking off from the surface of the lake. There didn't seem to be a lot of space to gather speed for take off but our trusty pilot got the Otter into the air and before long we were flying over the tree tops once again. Woodland Caribou Provincial Park is home to one of the largest herds of woodland caribou. As part of the Canadian Shield, the park features outstanding wilderness landscape which is characterized by an extensive lake system, boreal forest, and unique mix of vegetation. The park is also home to a variety of animals such as woodland caribou (for which it is named), moose, otters, beavers, black bears, timber wolves, fox, bald eagles, terns, osprey, pelicans, herons, painted and snapping turtles, frogs, and much more. Since conversation is out of the question during an Otter flight, we settled in and enjoyed the scenery as it passed below us again. Before long we were back on the float plane dock in the town of Red Lake and being picked up by Guy before heading back to the apartment.